ISTANBUL: The murder of journalist Jamal Khashoggi could alter the power dynamic in the Middle East by strengthening Turkey’s influence at Saudi Arabia’s expense as they compete for leadership of the Islamic world, analysts say. This certainly appears to be the goal of Turkish President Recep Tayyip Erdogan, the main regional supporter of the Muslim Brotherhood, which Saudi Arabia and its allies Egypt and the United Arab Emirates consider a terrorist group. The killing inside the kingdom’s consulate in Istanbul by a team sent from Riyadh on October 2 has already severely tarnished Saudi Arabia’s global reputation. But it is the potential involvement of Crown Prince Mohammad bin Salman, the oil-rich Gulf nation’s de facto leader known by his initials MBS, that could permanently damage Riyadh’s influence in the region. After initially insisting Khashoggi left the consulate unharmed, then saying he died in a brawl, the Saudi regime finally stated he was killed by a “rogue operation” and arrested 18 suspects, some with links to the crown prince. Analysts say Erdogan could use the ensuing crisis to weaken the 33-year-old prince, even potentially leading to the royal family removing him from power — though that seems unlikely. “The killing of Khashoggi has proven to be a golden opportunity for President Erdogan to pressure Saudi Arabia and work towards presenting Turkey as the new leader of the Muslim world,” said Lina Khatib, director of Middle East and North Africa Programme at Chatham House. “The Khashoggi crisis is a big geo-political gamble for Turkey and so far it looks like it is playing the game masterfully. But Turkey alone will not be able to push for the removal of MBS. The ball lies in the American court,” she added. For Erdogan, promoting the Muslim Brotherhood — which Saudi Arabia has sought to marginalise in the Arab world and which was ousted from power and brutally repressed in Egypt in 2013 by current President Abdel Fattah al-Sisi — is at the heart of this power struggle. The Turkish leader could also try to extract concessions from Riyadh for its ally Qatar, facing a Saudi blockade backed by the United Arab Emirates, Bahrain, and Egypt since 2017. “I think that Erdogan sees this as an opportunity to push back against a triple entente in the Middle East that opposes his policies. That triple entente is composed of MBS, MBZ’s (Crown Prince Sheikh Mohammed bin Zayed Al-Nahyan) UAE and Sisi’s Egypt,” said Soner Cagaptay, director of the Turkey Research Program at the Washington Institute. “These three countries, all Arabs, oppose Erdogan’s policies of supporting the Muslim Brotherhood. Now Erdogan sees a golden opportunity because MBS is vulnerable.” But Sinan Ulgen, president of the Centre for Economics and Foreign Policy, said “it remains to be seen whether Ankara can continue to leverage this conjuncture and turn it into a permanent advantage raising Turkey’s regional influence to the detriment of Saudi Arabia”. 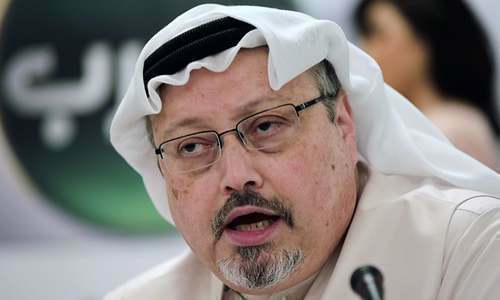 Nicholas Heras, an analyst at the Centre for a New American Security, said the Khashoggi case was the “latest chapter in Turkey and Saudi Arabia’s ongoing contest over which country is better” to lead the Muslim world. “Erdogan clearly seems to believe that he can use the Khashoggi crisis as a way to cut Prince Mohammad bin Salman, and by extension, Saudi Arabia, down to size,” Heras added. By not directly pointing the blame at the crown prince over Khashoggi, Erdogan is seeking to keep him under pressure, according to Karim Bitar of the Paris-based French Institute for International and Strategic Affairs think-tank. “Erdogan knows that he still has ammunition that could weaken MBS in the international arena so basically he is rolling the dice these days trying to figure out how to maximise his profit after this huge Saudi blunder,” he said. While the Muslim Brotherhood is important to Turkey, the West — especially the United States — is wary of the group and wants to focus any pressure on the crown prince towards ending the Yemen war and lifting the blockade on Qatar, the experts said. “I expect the blockade on Doha will likely come to an end in the near future and the Saudis find a way to support the UN’s efforts in Yemen,” said Steven Cook of the Council on Foreign Relations. Bitar noted that the US administration relies on Prince Mohammed’s support for any possible peace plan for the Israel-Palestinian conflict as well as containing Iran, long a Saudi foe. Washington could also push the crown prince towards “a rapprochement with Israel and to maintain a hawkish line towards Iran”, Bitar added. Hard to make out who’s the good guy here. Time to teach this young kid a lesson in international politics. No, power will remain where the money is not principles.